Good afternoon from lovely Desert South Texas – Yup reaching 100 out here in the sticks! I have completed my SAL Hearts for May project that Deb at Happy To Be Scrappy hosted last month! I am very pleased with the outcome! I named it Awakening Hearts because it turned on the light bulb in my mind why I was not progressing with UFO’s! I can already see the difference in not spending so much time on mail! This was an easy quilt to make but adding up the time to applique the hearts (including preparation time) 15.5 hours to applique the hearts, cutting out 270 (2 1/8″ squares) for the 9 patches (some fussy cut), sewing them (10 hours) and sewing the quilt together 6 hours (including borders). Total amount of time to make this quilt top was 31.5 hours. I usually do not count the hours it takes to make a quilt so you can imagine the hours that it takes to make a very complex quilt! I enjoyed the journey! Mountmellick is next – hoping to see you soon when there is a finish! I never keep track of the hours involved in a quilt. No desire to know. Just want to enjoy the pleasures. But I know there are people who are very structured in this manner. I have never done this. It was easy because it was a Heart a day. I just thought it was interesting info. Believe you me it is not my desire to do this ever again. Not a bean counter! Some people are a bit OCD and counting is a way of life. I love your completed top. I am still wondering what to do with my hearts but not spending too much time on the wondering. love the hearts and 9 patches together. Thank you Beth, fun time making this one. I like the hearts and the patch square. I at times keep tract of the hrs., etc if I plan on selling the quilt. I enjoy your blog, but understand if you need free time to live your life on your schedule. I will probably blog more than I think, but only when I have more to show than one block a day. I have never made quilts for $ but boy if we quilters ever counted the hours we spend in making a quilt we might get tired! LOL. Funny how a persons perspective changes when it is doing something for fun and not tie one down to a schedule! Stay cool if you can we are in a massive heat wave for the last 3 weeks…. Not going to be a good summer! OOoh, it turned out great! I was wondering if you would keep the colors together or mix it all up. Happy finish to you Nanette! 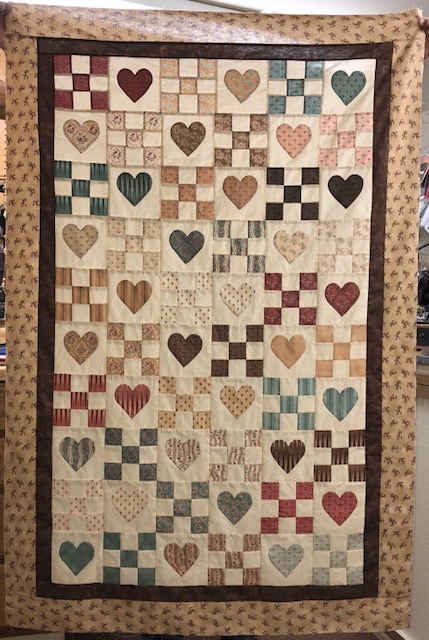 The heart quilt turned out terrific! Congrats on your awakening! Thx Laura, it really has helped to clean out the emails. I am still following you and look forward to your progress! Stay cool if hot in your area! Hi Ms Susan! Hope all is well. All made from those little piece of a fabric line! Still have some left over if I want to do another one! Thx for commenting! Thank you Rosemary! I love my quilt! Have a great day! Your new-found approach to life and setting goals is already paying off–wow! The quilt is great! But, really? If I had to deal with 100 degree heat, I’d die . . . I had to give up the outside walk (at age 73) until it cools off, doing my indoor exercise bike which helps the endorphins. I have been in South Texas the majority of my life and the last 8 years I have never seen so many days of over 100. Heat Index yesterday was 108!! Love how your quilt turned out. Enjoy the sewing time and off the computer time! Stay cool – 100 degrees is HOT! Thank you Deb! Thx for getting me involved. I am enjoying working on MM now without having to spend the time on the computer. Still follow my favorites, just cut out some unnecessary things. This is the 3rd day of 100 and more to follow. They are indicating cool down to high 90’s…..LOL. Your top looks wonderful. I need to pay attention to how much time it takes me. It would be interesting to know. Add the cost of fabric and WOW are they expensive. Now, if I could charge my regular hourly rate…I could make a living and no one could afford my quilts. LOL. Only in my dreams. Nice to have a finish! Congratulations! I don’t keep track of hours either. People always ask and I don’t have an answer. There are so many factors that determine how long a quilt takes to complete. Hope you fair well in the heat of TX. 2 of my daughters live in Austin. It is hot! Thx Dawn. It is very rare to have the high 90’s and 100’s in early May, UNLESS we have a hurricane coming early. A ‘normal’ summer is hot July and August and hurricane’s at the end of August! Hate to see the electrical bill!